STF Gardet, Sztokholm, Szwecja : Rezerwuj teraz! We offer fresh private rooms in modern Swedish bottling from Single rooms, Double rooms to bigger rooms for groups, friends and families. All with private bathroom, TV and Wi-Fi access. There is a fully equipped guest kitchen and we also provide breakfast all days (breakfast is not included in the price). At STF Gärdet you stay surrounded by greenery and open fields in northeastern Stockholm, 10 minutes’ walk from metro station ‘Gärdet’. From the hostel buses can take you to the central Stockholm in 15 minutes. 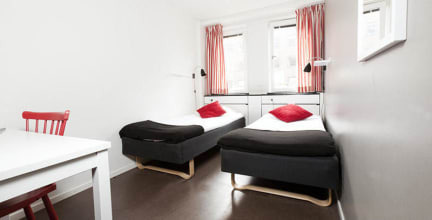 We offer fresh rooms in modern Swedish bottling from Single rooms, Double rooms and Family rooms All with private bathroom, TV and Wi-Fi. From 2019 we are completely cashfree, better for the environment and the safety of both you and our staff members.